It is important to note that all sweepstakes comes with sponsor’s rules and regulations. For those who host these contests and sweepstakes you have to be careful about the laws and rules you make. Those who participate should also take note of all the rules coupled with reading all the rules as well. The fact of the matter is that the rules that govern these sweepstakes are comprehensive and clear. For all those who participate in the online sweepstakes it is very crucial that read all the laws and rules. This is because you have to know a number of things that have to be considered as you take part. You have to take note of things like the cash prizes that could be won as you read the rules. Also read and see if you would find the unique prize that could be available with the hard to find tickets. Make sure you find out how the winners are chosen as there should be clear guidelines to govern this. You also need to read and find for yourself if all the information that you provide before entering would be treated as confidential and secure without it being divulged for advertising or other purposes. There have been many reports of people who have forfeited their prizes just because they had not read the rules and therefore were not aware of its contents. For some they just had to adhere to the rule that prizes had to be claimed within 14 days or 30 days and they couldn’t. As a matter of fact some folks could not appreciate the fact that some of the sweepstakes require them to enter only once per day. They break this rule and are then disqualified. That’s why it’s important to not forget that you should always read the sponsor’s official sweepstakes rules. I would love to become the winner of PCH because I can help my two daughters and my grandson be set for life also my family that are in need with Blessing from God. When I ordered from the PCH shopping store , I got several numbers. Gateway 6900 , 8035, and 7874 A. Random entry is 7874A and PC 360. Gateway 4249 , 4950 , 7233 and ID numbers 531775694716, 52179339811 and last Ty369. I would like to claim sole ownership to the WIN IT ALLSWEEPSTAKES. If i win im going to help everybody that need help oh yeah everybody especially the Navajo natives. If I won I could pay my house! I need to win. If I win PCH prize No. 6900, I would pay tithes then get my car fixed so I could get my teeth fixed. The VA does not do right by us Veterans. I would assist my sisters and brothers in arms get the benefits that the USA promised us. It seems after you sacrifice yourself and family for this country they flush you like used toilet paper. I need to win. If I win PCH prize No. 6900, I would pay tithes then get my car fixed so I could get my teeth fixed. The BA does not do right by us Veterans. I would assist my sisters and brothers in arms get the benefits that the USA promised us. It seems after you sacrifice yourself and family for this country they flush you like used toilet paper. I want to win that Prize?Thankyou. How can I win the $10,000.00 from PCH. I still Get VIP When You Text me what can I Do. 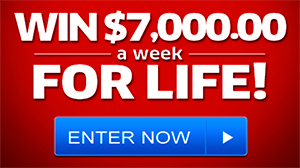 I receive a post-cardd to activate my chances to become the next winner for $7,000 a week per life. But I got confused and I don’t know where t activate de code. I just which I would be the fortunate one to win the big rise. Many thing will,change in my life I’am sick for 12 years now, I used to be a workaholic but due to my transplant I was not able to continuing working and my too children did not have the change to go to college. If I win the first thing to do if pay for them to get a career and pay old my medical bills.I know many people have problems that will be resolved if they get to be one of the winners. So,I hope I will be one of the lucky one. Thank you for the opportunity to have at least the chance to try t be one of the winners. My three grandsons could use this money to become any college graduate and change our world for the better. I REALLY want to win , but I can’t seem to get the code activated!!! PC291 !!! Can you help? I have been notified by pch that I may be possible winner of $7000 a week for the next draw plus vehicle of my choice and the $ 3,000,000 dream house my number is 4900. Everybody wish me good luck. I intend to donate every week part of my winning to the needy and under privileged. THANK YOU FOR YOUR HELP IN UNDERSTANDING THING BEFORE I REACT TO THEM AND BE VERY CAREFUL ABOUT SCAMMERS!! A Week For Life . What is it that I have to do so God will let me WIN the $7,000.00? Inell Jones on Pch $7.000.00 A week for life Sweepstakes Gwy no 4900. Plus I would like to win the $ 5,000.00 every week for life on April 30th 2015 pch gwy no 3148, 4900. Of I read the sponsor official sweepstakes rules my mom taught me to read before agree cause u don’t know what you might be agreeing to. After the call this morning, I went over the rules again to see if I ha done something to question any rules I may have ignored. If I did please help me I cannot see where I may have made an error. if I could give my family what they need and other what they need I would fill my goal. I always read the sponsor’s official sweepstakes rules… This is normal thing for me.